Thatchers, the iconic, fourth-generation cider makers based at Myrtle Farm in Sandford, Somerset, has purchased a Spider 1 remote-controlled mower from supplying dealer, Loxston Groundcare. The new mower will be used around the ever-expanding cider mill and the adjoining orchards, to ensure that the premises are maintained to the highest standards. 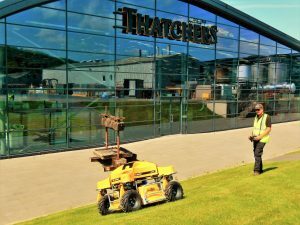 Commenting on the new mower Neil Day, Operations Director at Thatchers said: “We were founded on this site in 1904 and the current Managing Director, Martin Thatcher, is the fourth generation of the family to head the company. Under Martin’s stewardship the business has grown substantially and with that success we have had to increase the infrastructure here. Most notably, the production facilities and warehousing. As a rural company with an international profile, we are considerate about our impact on the environment and keeping the profile of our buildings as unobtrusive as possible. 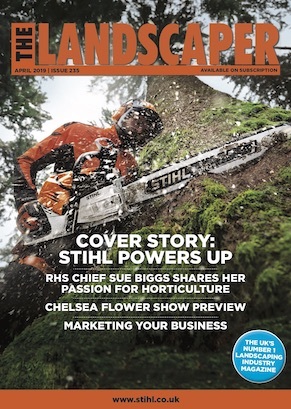 “Using the internet, I found various videos of Spider mowers and their tracked competitors,” Ed said. “I discounted the tracked versions as they appeared too aggressive on the turf and then reviewed the Spider website. I sent an enquiry to Spider’s UK Sales Manager, Nick Penn and a demo was quickly arranged here at Myrtle Farm. I was very impressed, as was Neil, and we virtually placed our order ‘on the spot’.